GOSF (Great Online Shopping Festival) in December, 13 ended with many of us drained in terms of our resources, be it in terms of our eyes popping out of socket due to fatigue of hours of watching, comparing and selecting various products on various websites or be it money wise. We were drained!! Then came the good times, when we started wearing or using all those awesome products that we purchased. I basically did my shopping from myntra.com and jabong.com. I love both the websites in terms of their product delivery and their customer service and in every other respect too. Today, I will be sharing my experience with Jabong.com. What they did needs a special mention. I placed two orders on their website and did an overall shopping of almost 3-4k. One top I returned back as I didn’t like it much and they took it with no hassles and completely adhered to their no questions asked policy. I loved that. Money was credited back into my credit card in the stipulated time period. Now, one ‘W’ kurta that I purchased, I wore it once and afterwards washed it as per the instructions mentioned. It was a viscose kurta and a beautiful one. After the wash and iron, I noticed that the neck opening has threads coming out and that has made it totally unwearable. I felt so bad as I loved the kurta and I didn’t want to hold on multiple chats and communications with Jabong’s customer service team. But, I had to!! I wanted to make this whole process as small as possible, so first I clicked the neckline pics of the kurta and then compiled a mail to jabong including those pics. I explained everything in the mail including the wearing and washing thing. And I wrote this mail tothe hod, customercare’s id. I got a call from jabong very soon and they informed me that they will take the kurta back, no questions asked , no tags wanted, no same packaging as I didn’t have the packaging. It was over a month. I had the tags and an extra button that they gave so I mentioned that and they agreed. Wwwoooowwww. Such a fast and easy resolution!! I didn’t have to call them again or do follow ups. It was not their fault but it was completely brand’s fault. But they gave me full satisfactory resolution. Does that happen in India. Do companies believe us that much now!! I have seen some website which don’t accept any return or refund, they only accept returns in case of damaged items and not even for ill fitted shoes, do they accept returns!! I loved how Jabong.com provided the resolution. They got my kurta picked up in next 2 days and further in next two days, they gave me refund in the form of jabong credits. This, they have mentioned earlier in telephonic conversation that I will get refund in form of jabong credits and I don’t mind that as I am very much into online shopping and I can use those credits very easily. The best part I loved in this refund process is that they made it so easier and simpler and what I was fearing, that never happened. I was a happy and satisfactory experience. I was a genuine customer with a genuine problem. I didn’t cheat or did that ‘wear once and return’ thing. That too happens and happens a lot, I know. I hate that. That’s why, most of the websites have such strict rules for returns. One should not do such things for a few bucks. We have to be honest and then only, we can expect that honesty in return. It is so shocking if you get the approx figures of shop lifting and all those cheating techniques. Be good, do good and good will eventually happen to you!! A special thanks to Jabong.com for their amazing customer service and policies. You people made my online shopping experience a real pleasure. I will always come back to you. 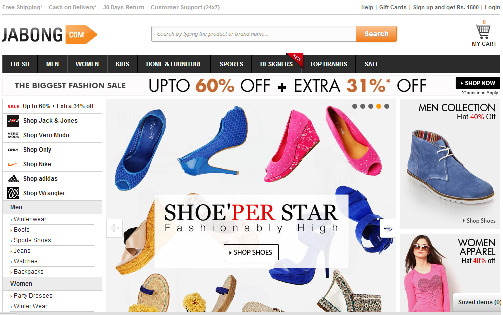 Jabong.com is a genuine online website with great discounts, very competitive prices and a great customer service. I fully recommend it. Jobong is one awesome site. Need to check out that sight thanks for sharing. I have heard many great things about this site lately. I'm following you in facebook and gfc, okay? That was nice of them.. they truly care fr their customers!! Great review doll! Thanx for sharing! I too love Jabong! Great review!!! wow.. never heard of them.. will definitely check them out!!! I know this is so important. I had a horrible experience with a company called cool chairz, they misrepresented a chair on their site as a computer chair-meaning it is for 6-8 hours of sitting time but the company that makes actually calls them "visitors" chairs which is meant for very short term sitting. I was told by the rep that the tilt feature was adjustable and when I called the manufacturer they said it was not. Cool Chairz refused to take it back. So $150 down the drain. Its a good thing when sites like this treat their customers well. God, their customer service sounds so awesome!! I really love it when companies are like that! Ok!!! Great review. I've to check this site. I have never heard of Jabong. Great customer service though . It's so important for a company to really care about their customers. Have shopped from them N number of times and every time loved them! Its a great site with amazing discounts! thanks for visit my blog…i follow you on bloglovin and gfc…follow me back? thanks for visit my blog…i follow you on gfc and bloglovin: follow me back? So glad their customer service was nice. So awesome. Very nice post, I buy a lot of staffs from them…and they are always prompt. I love shopping from jabong. Kind off get the latest trends now days ! Hi dear, thanks for visiting my blog the other day! You have such a lovely blog too. Thats so sad!! I hate such websites , better stay away from such frauds!! Really!! Then you must, this site is fabulous!! Just followed you back love! Absolutely love your post. Can't wait for the next one! I always love hearing about companies that have good customer service! Ordering online is so hard sometimes, so its nice to know the company will work with you! I have never tried your favourite shops, but I will have a look. It's always great to explore! I will keep them on mind!